"Buy Korea 2011” took place at KINTEX in Goyang, north of Seoul, on Jan. 11-12 and gained ground with the attendance of more global buyers than in previous years. The exhibition attracted 1,090 buyers and sellers ― 671 buyers who visited Korea, and 114 sellers and 305 buyers who held on-line negotiations. In particular, global buyers with more than $100 million in annual sales accounted for 258, or 38.5, percent of the visiting buyers, followed by 223 buyers, or 33.2 percent, each of whom had more than $10 million in annual sales. KOTRA said the value of negotiations held between the buyers and the participating 2,575 Korean companies was $15.5 billion, including $150 million for imports. The 11 cases in which a letter of intent was signed were worth $290 million, while the value of contracts reached on the scene was $940 million. Buy Korea 2011 covered an exhibition space of 21,384 sq. meters with 700 off-line export negotiation booths, 100 off-line negotiation booths, 20 on-line negotiation booths and 50 exhibition booths designed to display brands guaranteed by KOTRA and world-class items. The fourth annual trade fair has provided a platform to not only companies who are seeking their products, but also those who want to establish a partnership with foreign companies. The visiting foreign buyers held one-on-one negotiations with Korean counterparts. Korean exporters’ interest in the show was huge. A total of 2,373 Korean companies applied for 14,005 trade negotiations, three times as many as the trade fair’s handling capacity of 4,900 negotiations. The exhibition saw a rise in buyers over the previous year from China and India where investments soar with higher growth rates as well as the Middle East and Africa. Chinese buyers surged 34 percent over the previous year, particularly centering on the cosmetics and fashion fields thanks to the surge of the Korean Wave, hallyu. Buyers from the Middle East and Africa jumped a whopping 110 percent, focusing on the purchase of automotive parts and IT components. Indian companies’ participation in the trade fair was apparently significant. The top 10 Indian conglomerates as well as Indian automaker Mahindra & Mahindra’s original equipment manufacturing firms were among the participating global buyers. The attendance of the conventional trading countries also showed no sign of abating. The buyers from Europe and the Americas showed a keen interest in the new and renewable energy and IT fields. A few buyers from Ontario, Canada, which became the subject of attention with the provision of the biggest fee-in tariffs, came to the exhibition with the goal of forging strategic alliances with Korean counterparts. Among the pack were such German wind power companies as Ambau and Korwind in search of Korean-made parts. 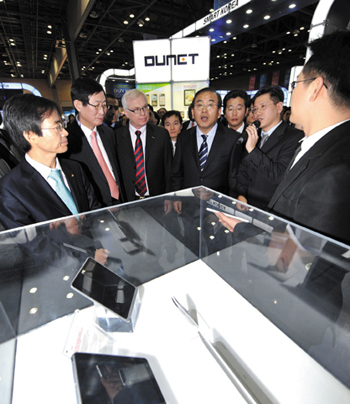 Such global IT firms as Broadcom and Haier also participated in the exhibition to buy Korean-made IT products. (above) A view of the Buy Korea 2011 Exhibition, held at KINTEX in Goyang on Jan. 11-12. Accompanied by KOTRA President Cho Hwan-eik, Vice Minister for Trade and Energy Park Young-june tours the exhibition booths.